I WANT TO GET MY HAIR CUT SHORT SO BAD!!! It seems like everyone from friends to celebrities to favorite bloggers are making the chop and I want to join the party! But do I? Yes I do. But right now? No not right now. Am I sure? Yes, keep it long just a little bit longer. But short looks so cute! But… long! It seems like I have this same silly conversation in my head every day. But seriously though. All these women are rocking the long bob. 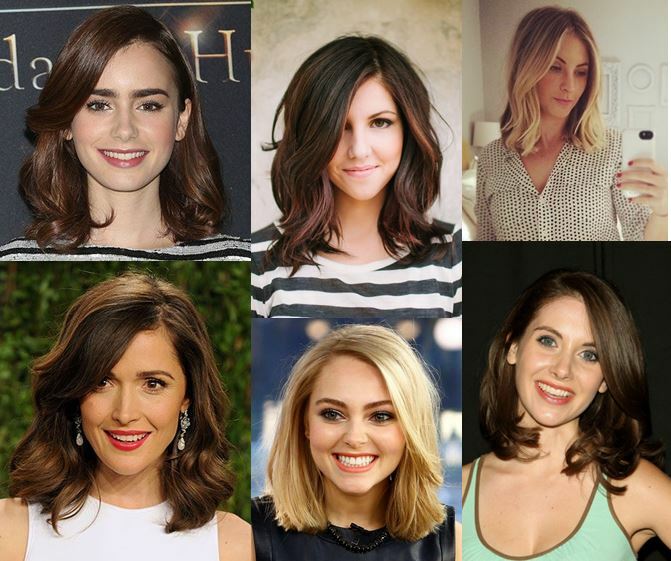 My hair never seems to do the choppy look like AnnaSophia Robb (bottom middle) or Emily Schuman (one of my favorite bloggers at Cupcakes & Cashmere, top right), but I think that the look Alison Brie (bottom right) has going on is just up my alley. Short, playful, lots of movement, oh I need to look away before I make a hair appointment! I am trying to keep my hair at the longer length until at least the spring (for what reason? I really have no idea) but who knows… I might just break down and show up to work one day with a good majority of my hair not there! I guess we’ll see how long I can hold out! Oh goodness, I’m the same way. I go through long periods where I grow it suuuuper long (for me, anyway! ), then chop it off to chin-length and start the whole thing all over again. I’ve never had one “main” hairstyle; I just grow it until I’m tired of it, then go back to the beginning. I’m in the long bob phase right now myself, and I’ve decided this is my favorite look! Though my hair is really wavy/frizzy/curly, it seems more manageable and purposeful when it’s shorter. When it gets too long, it’s just a scraggly mess. Need to remember that!